Description: This book contains the history of the early application of electric action to the pipe-organ, together with biographical sketches of the pioneers in this area (C. S. Barker and Dr. Péschard). Hinton, Dr John William. Mus.B. (Dublin, 1871), B.A. (Dublin, 1872), Mus.D. (Dublin, 1874), M.A. (Dublin, 1876). Studied at the Paris Conservatory; pupil of César Franck. Organist of St. Mary’s, Charing Cross Road, London, 1876; St. Stephen’s, Guernsey, 1877-90; St. Michael’s and All Angels, Woolwich, London, England, 1891-1909; the Church of the Ascension, Blackheath, 1909-12; St. Matthew’s, Westminster, London. Professor of organ and singing at the Trinity College, London. b. Edmonton, England, Apr. 26th, 1849; d. Bournemouth, Feb. 1st, 1922. “Far more interesting than may at first appear from the titles and authors” - Dr Brian Hicks - The Organ, Autumn 1997. What they said about the 1909 edition. The Organist and Choir Master-October 15, 1910. "The author has traced the evolution of the Electric Organ from its earliest beginnings in a most interesting manner . . . Many personal reminiscences of events and persons . . . useful illustrations." Musical News-October 23, 1909. "The author's reading has been wide, his research extensive, and he assesses the various claims with fair judgment. . . Besides useful historical information his technical writing is clear, and his treatise one of real practical utilitu." Musicians' Journal-April, 1910. "Brimful of infromation. . . This valuable work is just what not only Organist but all interested in modern Organ Construction have been looking for. . . Is a faithful, unbiased and interesting history of the rise and development of Elecro-pneumatic action as applied to Organs. " Music-November, 1909. "Is especially welcome at a time when organ-building is proceeding fast. Iteresting . . . will appeal to all who play or listen to the King of Instruments. . . Contains many useful diagrams, and can be recommended as a most useful addition to the literature on the subject." English Mechanic-September 17, 1910. 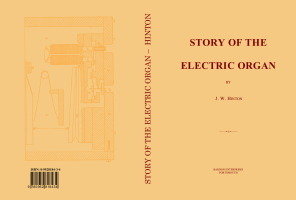 "(Our) readers who know how lucidy Dr. J. W. Hinton writes from actual and intimate knowledge, will we are sure, hasten to procure his book, the "Story of the Electric Organ,". . . traces the evolution . . . incorporating personal reminiscences of more than ordinary interest and value . . . supplemented by comprehensive appendix in which typical systems of electrical action are figured and described." Mechanical World-February 18, 1910. "Dr. Hinton's book is an exhaustive account of the various inventions which have been introduced." Referee-October 16, 1909. "Dr. Hinton's Story of the Electric Organ will appeal chiefly to practical organists. . . Numerous illustrations and a convenient index increase the book's usefulness." The Choir-October, 1910. "Will prove an invaluable addition to the library of the Organ Strudent."